Enermax on Monday introduced its new LiqTech TR4 II closed-loop liquid cooling systems, which are designed for use with AMD’s latest Ryzen Threadripper 2 processors. Just like its predecessor, the new LCS covers 100% of processor’s IHS surface and can dissipate up to 500 W, which is well above AMD’s official 250W TDP specification. And following the latest trends, the new lineup also features addressable RGB LEDs. The new Enermax LiqTech TR4 II Threadripper 2 lineup consists of LCSs featuring 360, 280, and 240 mm radiators outfitted with multiple fans of appropriate sizes. Being aimed primarily at AMD’s latest Ryzen Threadripper 2 processors, the coolers can dissipate an excessive amount of heat. Enermax is rating the coolers to remove up to 500 Watts of heat, which is twice (or more) the processors' official TDP. Architecturally, the new LiqTech TR4 II feature the company’s micro-channel-based design with a shunt channel (the firm calls it SCT) that maximizes cooling performance, something that the original LiqTech TR4 AIO AIO cooler did as well. Meanwhile, the main difference between the two LCSes are addressable RGB LEDs featured on the latest models. The LEDs are controllable using a control box that the manufacturer supplies as well as software from makers of motherboards (yet, Enermax does not say which ones). 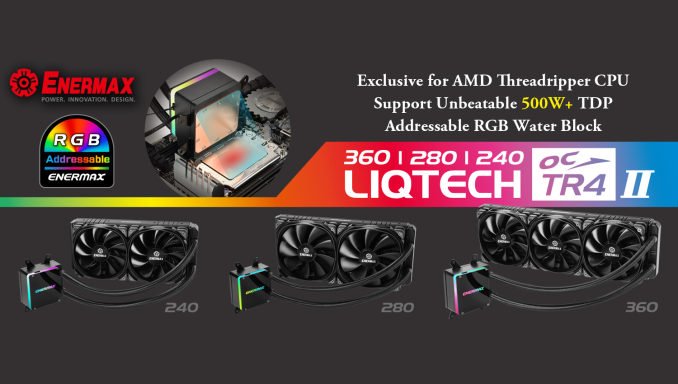 Enermax plans to start sales of the LiqTech TR4 II LCS this month. The top of the range 360mm model costs $160 at leading retailers like Newegg. Others will start at $140. All the CLCs, even the popular Asetek ones, have a copper cold plate and an aluminum radiator. That's exactly why the CLCs can hit aggressively low pricepoints to have near parity value to tower air coolers. Sadly, I can almost guarantee that they will be. I went through quite a few of them before I gave up.